It’s been a rainy day at camp but it’s still lots of fun! We did barn chores and met all the animals. We collected eggs and milked the goats. A Red Pepper milks Dorothy during barn chores. We learned about bees this morning too by reading a book about the queen bee. While we read the book we tried honey sticks to actually see what the bees make. 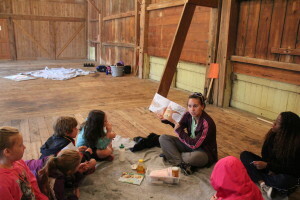 Ms. Rachel reads the queen bee book to the Orange Peppers. In Garden Kitchen we made chips and salsa! 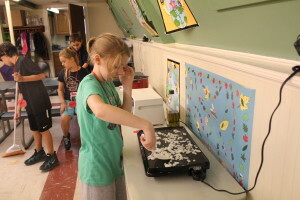 We cut up our tortillas and cooked them on the griddle to make them nice and crispy. A Yellow Pepper squeezes a lime for their salsa. 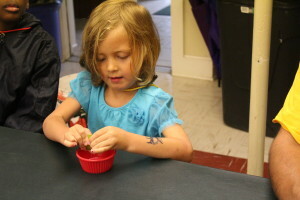 Ms. Katie helps an Orange Pepper use a knife to cut up an onion. 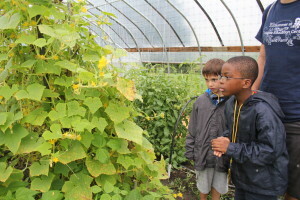 In the afternoon we spent time learning about plants in the gardens and hoop house. 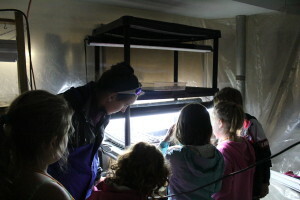 We saw the grow room where the seeds are started before they are put outside. Since we were learning about where plants grow we did an experiment where we put seeds in with a paper towel to watch through the week to see if it starts to sprout. Ms. Rachel shows the Orange Peppers the grow room. Yellow Peppers check out the plants in the hoop house. Red Peppers pick basil in the education garden. 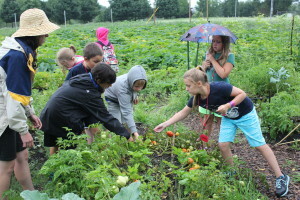 While it wasn’t raining we got to play in the children’s garden for a little bit. We saw the awesome smelling lemon balm plant and the popcorn plant! 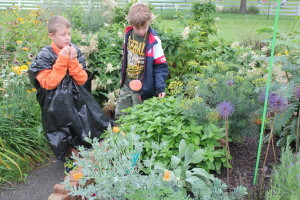 Orange Peppers smell the lemon balm plant in the children’s garden. In afternoon Garden Kitchen we made three sisters soup. It was the perfect day for soup and it warmed everyone up from the rain. We learned why it was called three sisters, too. The sisters are corn, beans, and, squash and they are called sisters because they are often grown together and are a well balanced meal together. 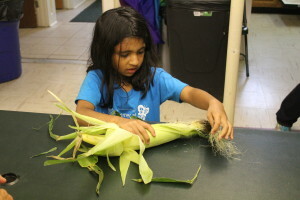 A Yellow Pepper removes the corn silk. A Red Pepper sautes the onions for the soup. What a fun day at camp we had! Tomorrow is chicken day so I hope you’re excited to meet some of our feathered friends. Chop 2 small tomatoes and place in large glass bowl. Roll lime, slice in half and squeeze out juices. Use food processor to mince garlic. Chop ½ green pepper, using food processor for small dice if necessary. Using a pizza cutter, slice tortillas into small triangles. Lightly season tortillas with salt & pepper and then bake at 350 degrees until crispy. In a large pot, bring the water to a boil with the squash, beans and corn. Cover and simmer over moderately low heat until the squash is just tender, about 15 minutes. In a large skillet, heat 2 tablespoons of the oil. Add the onion and bell peppers and cook over moderate heat, until softened, 8 minutes. Add the cumin, oregano and cook, stirring, until fragrant, about 4 minutes. Stir the vegetables into the stew and season with salt and pepper. Serve soup & sprinkle with the remaining 1/4 cup of chopped basil & cheese and serve.